It’s that time of year where my semester is over, and I’m back in the midwest for the holidays. I typically drive back by myself, so I always stop in Chicago for at least a night, sometimes a few days, just to catch up with friends and drink tasty beer I can’t get in Pennsylvania. I usually get to chose where we go when I’m in town. 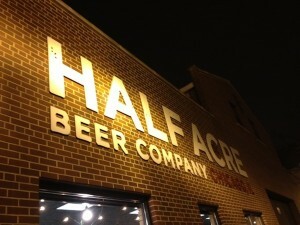 Half Acre’s taproom is relatively new, but I had always written it off because of the notion that it wasn’t close to any train lines. Wrong. It’s only about a 15 minute walk from the Montrose stop of the Brown Line, making it really convenient for those who reside on the North Side. When Geoff and I walked in, we were carded and asked if we had ever been there before. We hadn’t, and so the guy working the door gave us a useful rundown: no servers except on Fridays and Saturdays, they don’t have food, but you can order delivery from anywhere you wanted, and credit cards can only be used for purchases of $10 or more. He even suggested Bad Apple for food, which is where we had dinner– a great, reasonably priced beer bar kitty corner from the brewery that also happens to have excellent food. The taproom is a really cool combination of concrete and wood– it’s industrial and natural at the same time and, with the soft lighting, it was really inviting and warm. The bar itself was concrete too, which looked really slick, and had coat/purse hooks underneath, which has become my new standard for the amount of thought that goes into bar design. 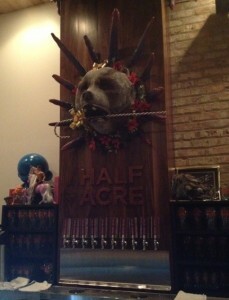 Kudos, Half Acre, for the hooks. Geoff also noted that there were shelves above the urinals in the mens restroom for setting your beer, which he thought were cool. The slightly creepy bear made festive! Most of the tables are communal, made of nice wood in the style of picnic tables but with backs on the benches. We eschewed them for the bar– almost anyone who’s ever drank with me can attest that I’d rather sit at the bar when drinking than at a table– I blame the years bartending. Geoff hates hops, hates them. So sometimes finding a beer he likes can be a challenge. Despite having “only” six taps, there was beer that he enjoyed, especially the Hammer, the Bullet, and the Vise English brown ale (which is all one beer). 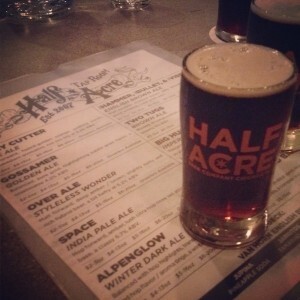 I went with 5oz tasters of: Space IPA, Two Tugs brown ale, Alpenglow winter dark ale, and Hearth’s Ablaze stout. Sadly, they were out of the barrel-aged Baume, and had replaced it with a less enticing extra special bitter, so I passed. Prices were really reasonable, with 5oz tasters being $2-3, 13oz $4-5, $5 for 16oz, and $6 for 20oz, depending on the beer. 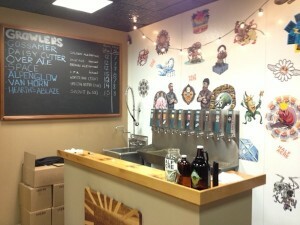 We had a good time in the taproom; the staff was really nice and attentive. Afterwards, we stopped by the giftshop because the taproom can’t sell beer to go when the giftshop is open. I picked up bottles of Big Hugs and Quakerbridge for Russ and myself respectively. The guy checking us out was kind of snippy with me, which was unnecessary, but I’m going to chalk it up to it being almost the end of a long, and likely busy shift. 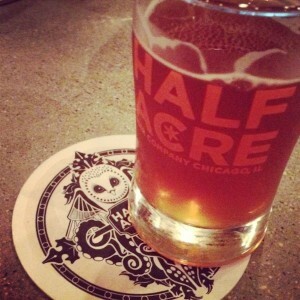 If you’re in Chicago, especially looking for good beer right off the El, I recommend checking out Half Acre! Last updated by Paige Deckert at December 20, 2012 .